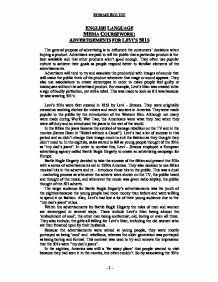 ENGLISH LANGUAGE MEDIA COURSEWORK: ADVERTISEMENTS FOR LEVI'S 501S The general purpose of advertising is to influence the consumers' decisions when buying a product. Advertisers are paid to tell the public that a particular product is the best available and that other products aren't good enough. They often use popular culture to achieve their goals as people respond better to familiar elements of the advertisements. Advertisers will tend to try and associate the product(s) with images of sounds that will make the public think of the product whenever that mage or sound appears. They also use associations to create stereotypes in order to make people feel guilty or inadequate without the advertised product. 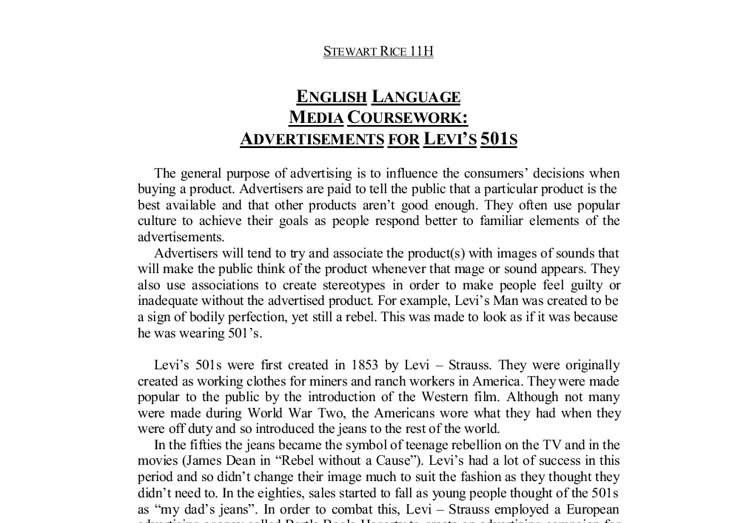 For example, Levi's Man was created to be a sign of bodily perfection, yet still a rebel. This was made to look as if it was because he was wearing 501's. Levi's 501s were first created in 1853 by Levi - Strauss. They were originally created as working clothes for miners and ranch workers in America. They were made popular to the public by the introduction of the Western film. ...read more. For each advertisement the music actually related to what was happening within the advertisement as well as the message at the end. For example; in 'Launderette', the music is Marvin Gaye's "I Heard It Through The Grapevine." which signifies that the actions of Levi's Man (played in this advertisement by Nick Kamen) would have been talked about a lot. The reason that music was used instead of dialogue was because of the dual marketing campaign to re - release the vintage musical hits at the same time. Levi's try to create a "want to buy" ethos by using images of Levi's Man's intense pleasure at wearing the 501s to show how pleasurable the 501 can be. They also show the 501s being used in unusual and 'wacky' ways to show that a pair of jeans can be more than just boring clothes. CLOSE ANALYSIS: - LAUNDERETTE A 50's Cadillac drives passed a launderette in a 'typical' American street. There is a man in US Army uniform standing by the door. Nick Kamen arrives and walks in. Nick Kamen enters the launderette and takes off his sunglasses. ...read more. The launderette scene then fades, to be replaced by the image of a pair of 501's sporting the caption "NOW AVAILABLE STONEWASHED" in the following format: The shared images all seem to denote parts of the desirable stereotype of Levi's Man. For example, the steam from the washing machines adds to the shared image of heat in the advertisements and is there to contrast from the 'cool' image of Levi's Man. The tanned body shows that Levi's Man is fit and is likely to get the girl. It also contrasts the old, conformist, and conventional people in the advertisements. Other contrasts are the white boxers being plain and boring, contrast the 501's which are denoted and being fun and 'colourful' in comparison. After the first year of the campaign, sales of 501's were up by 800% compared with the year before. The sales of white boxer shorts rose by a similar amount at the same time, due to the fact of Levi's Man nearly always wearing white boxer shorts. The sales of other items featured in the advertisements, BryllCream or sunglasses for example also rose. From this information, I think that the advertising campaign was a success for Bartle Bogle Hegarty and for Levi's. STEWART RICE 11H - 1 - ...read more. has now ordered L'Oreal to add a disclaimer to future adverts whenever models are wearing false lashes. Cosmetics companies such as Maybelline, No7 and Rimmel have continuously produced adverts showing attractive, flawless women, whereas in recent years, these brands have faced a backlash from Dove, another cosmetics brand. The color and font of this text could stand for several ideas: (1) the commercial's message is pure and untainted by politics, (2) the drug trade is surrounded by evil (black), or (3), simply that the text is meant to stand out. A typical marketing plan is based on where are we now, where do we want to go, how can we go there and how can we control it. The contents of a very basic marketing plan include an executive summary, situational analysis, SWOT analysis, objectives, strategy, action programme, financial forecast and controls. "The aversion of the eyes and lowering of the head can indicate withdrawal from a scene and symbolize dependency and submissiveness" (Dyer, G. Advertising as Communication). She gives the impression that one half or her doesn't want to be there with the male and that she is not happy about something that has happened or is about to happen. It is presented in one column. The tone of the text is light hearted dull with a joke in each of the first two sections. Each paragraph has a bold sub-heading to start it. It states the subject of what it is going to talk about. A comparison of advertisements over time. Looking at more closely two of the advertisements in particular, it is evident that the graphology or presentation is completely different. Although both advertisements B and D have a layout consisting of a picture, a headline, writing describing the product, and then a logo complete with a slogan, the format of these contrast markedly. advertisement, the lexis used is completely different. The main title, bananas, is very misleading as some people will think that it is about bananas, while, in fact, it is about something completely different: here bananas means mad or crazy The title is very bold and attracts attention. Also: 'This supremely elegant building epitomises many of Foster's beliefs as an architect.' This can be seen as a metaphor with the 'building' representing the watch epitomising 'many of Foster's beliefs as an architect.' 'The interior is extraordinarily light and airy.